The title of the exhibition has been borrowed from De Chirico in reference to his metaphysical landscapes. In this new series of photographs and a video, we see monumental buildings, empty squares, and a single car, all taken in the center of Bucharest, in places that played a role in the 21 November 1989 uprising. 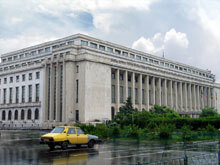 Tainted by the past presence of Nicolae Ceausescu, these ghostly buildings as a group represent an unfamiliar face within the city, and their reuse or reinstatement often happens in an awkward and offhand manner. Frequently abandoned, they can only hope to resist slow decay, while the citizens look on with contempt, hoping for their ruins. 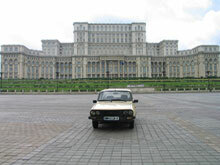 In contrast, the car parked close by is a familiar DACIA, of Romanian production, with a clear socialist line. Hence, the story that is told by the building through the history surrounding it, is very different from the one projected by its pompous exterior. 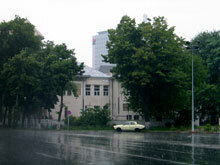 The reuse of buildings during newer, perhaps more prosperous, and politically often radically altered times is common practice. A recent example of an extreme makeover is the Reichstag in Berlin, once the feared headquarters of the Nazi, that, in order to shed its dreadful reputation, was changed into a parliamentary tourist attraction by Norman Foster. 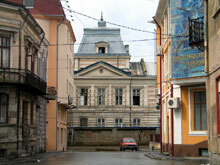 The entry to the European Union in 2006 will probably accelerate renovations in the historical center of the city. Hopefully, worthy solutions can be found to make over the current architectural skeletons and stop the decay of the socialist workers' housing.